Las Vegas homeowners continue to opt for artificial grass to spruce up their lawns. With the cost-savings and ease of maintenance it offers, it is becoming a smart alternative for homeowners who want to save time and money on landscaping. So what exactly is an artificial grass lawn good for? Parents who want the best for their kids often have a big lawn in mind as they build their dream home. It gives a breath of fresh air, and is the ideal place for a playground. Good thing, artificial grass eliminates the need for maintenance, as we all know raising a child requires serious time and effort. While your lawn looks neatly trimmed with artificial grass, the best part is that placing your playhouse, slide, and swingset wouldn’t kill the grass beneath it. You won’t see any bald spots despite the heavy traffic of kids running around or bikes being parked on the lawn. Even dogs won’t dig it up and create a mess. Who doesn’t love mini golf? Whether you’re just looking to unwind on your own or hosting fun tournament with friends, artificial grass is the sure option. It keeps your mini golf course looking flawless, and will be envy of every neighbor. Come invite your neighbors at any time for a game and forget taking the extra time to prep your mini golf course. Also, don’t just limit yourself to your lawn. You can also build a mini golf course on your roof deck. That’s what makes artificial grass a wise choice — there’s no downtime in waiting for that grass to grow. 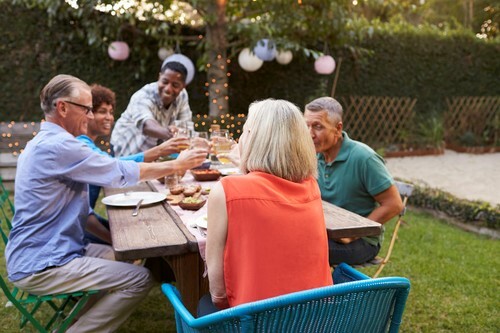 Whether it’s a neighborhood BBQ or a small get-together with family and friends, backyards are the ideal place to throw that party. Cleaning up your lawn and making sure it’s green and healthy is just another chore you want to skip. No need to stress out before the party, because your artificial grass lawn is sure to look perfect 24/7. And even after the party, you don’t have to worry about mud stains getting in your house. With artificial grass, you never have to water and tend it. It’s the answer for homeowners who don’t want to maintain their lawn or pay for gardening services. Think about the year-round savings. It’s function and designed combined into one. Installation companies like Las Vegas Artificial Grass Pros offer a free design consultation for artificial grass installment. Schedule a meeting with them a call to find out more.